The product is made up of 9 bronze coins from nine reigns of emperors of Ching Dynasty tied with red thread with an endless mystic knot, a double bat amulet and green-beaded red tassel. This potent combination makes the emblem even more auspicious. The endless mystic knot is powerful to ensure sustainable fortune and wealth for the owner. It is the emblem that epitomizes the powerful Ching Dynasty's blessings. Hung one in each of the 8 directions, one is fully protected from problems and blessed with good energy from all directions. What the 9-Emperor coins symbolizes and how to place the object? 9 Emperor Coins tied in red thread consist of coins that are from the first nine Ching Dynasty Emperors from the following reign: - Shun Chi (1644-1661), Kang Hsi (1661-1722), Yung Cheng (1723-1735), Chien Lung (1736-1796), Chia Ching (1796-1820), Tao Kwong (1820-1850), Shen Fung (1850-1861), Tung Chi(1862-1874) and Kwong Shui (1875-1908). Feng Shui masters believe that the 10th emperor is not considered auspicious because Ching Dynasty collapsed during his weak rulership. The dragon breathe for Ching Dynasty had ended after 9 generations. 9 is also a lucky number which represents abundance from the harmonization of heaven and earth. 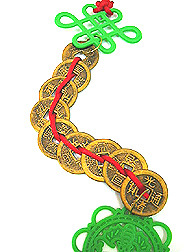 9 Emperor coins with red thread and mystic knot is essential to empower it for endless fortune. The coins must be made of fine metal such as brass or bronze, which are strong and elegant. Some versions are made of resin and brittle in nature, try not to get those version because they lack in metal energy. 1. To increase your business fortune, stick 9 emperor coins on to all your important files, bank books, invoice books and order books, cheque books, in your cash boxes and safes, inside your pocketbook and any folder or item to do with your income. 2. Similarly you can stick this potent wealth attractor on to your fax machines, cash register and computers to attract opportunities through these avenues. The yang side must always be up. 3. You may also tape 9 emperor coins in southeast corner of your bedroom, workdesk, living room etc to activate your wealth corner. 4. 9 Emperor coins placed in Northwest is a must to activate your mentor luck to bring you important network and helpful people coming into your life. 5. For bosses or employees, hang them behind your chair or on the wall behind where you sit to obtain strong financial luck and support from the 9 Emperors. 6. To excel in studies and scholastic pursuits, you can use 9 Emperor coins as a bookmark to ensure they help you achieve your goals. 7.The 9 Emperor coin is also a potent metal cure to dissolve the evil 5 Yellow (bring fatality, accidents and mishaps) and illness star-2 (bring long term illness). 8. For those in business or looking for more achievement in life (to leapfrog to next level of excellence), you may hang the 9 Emperor coins above your door inside your house to represent endless wealth had entered your house. 9. You may also hang the 9 coins in your car for good luck, prevent accidents and having happy tidings from any business ventures wherever you travel. Bad chi in your car can also be dissolved to prevent bad luck.